It is important to support cognitive functions – but what do people mean by “supporting cognition” and which cognitive functions should be supported? Most cognitive research is conducted in laboratory settings under tightly controlled conditions, using naïve participants (typically college students) performing artificial tasks with limited context and well-defined goals. Many useful findings have come out of this experimental tradition, but it doesn't closely map onto the conditions people commonly face. Klein, Klein, and Klein (2000) wrote the first paper explicitly addressing macrocognition, pointing out the differences between the way people think in natural versus laboratory settings. Klein et al. (2003) presented an account of macrocognition that identified the key functions and processes that emerge once we step out of the laboratory. 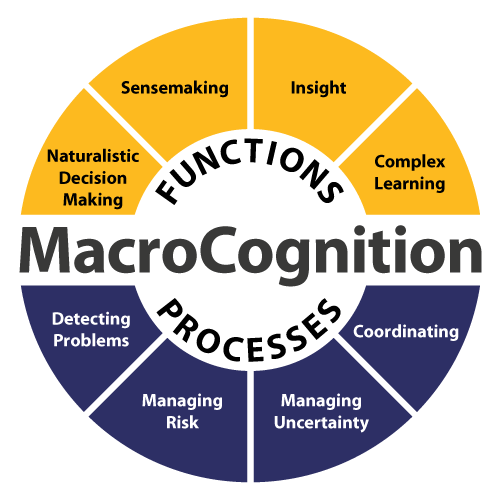 We now define macrocognition as the cognitive adaptation to complexity. Leading figures in psychology such as George Miller and Alan Newell have encouraged researchers to get out of the laboratory and study the way people actually think under complex conditions, but to no avail. The field of macrocognition supports researchers who want to understand the nature of thinking in natural settings. Klein, G. (2013). Seeing What Others Don't: The Remarkable Ways We Gain Insight. New York, NY: PublicAffairs. Hoffman, R., Klein, G., & Miller, J. (2011). Naturalistic investigations and models of reasoning about complex indeterminate causation. Information, Knowledge, Systems Management, 10(1-4), 77-83. Klein, G. (2011). Streetlights and Shadows: Searching for the Keys to Adaptive Decision Making. MIT Press/Bradford Books. Klein, G. (2010). Macrocognitive measures for evaluating cognitive work. In E. S. Patterson & J. E. Miller (Eds.) Macrocognition metrics and scenarios: Design and evaluation for real-world teams. Ashgate. Crandall, B., Klein, G., & Hoffman, R. (2006). Working Minds: A Practitioner's Guide to Cognitive Task Analysis. MIT Press/Bradford Books. Klein, G. (2003). The Power of Intuition. New York, NY: Doubleday. Klein, D. E., Klein, H. A., & Klein, G. (2000). Macrocognition: Linking cognitive psychology and cognitive ergonomics, Proceedings of the 5th International Conference on Human Interactions with Complex Systems (pp. 173-177). Urbana-Champaign: University of Illinois at Urbana-Champaign. Zsambok, C. E. & Klein, G. (1997). Naturalistic Decision Making. Mahwah, NJ: Lawrence Erlbaum Associates. Klein, G. A., Orasanu, J., Calderwood, R., & Zsambok, C. E. (Eds.) (1993). Decision making in action: Models and methods. NJ: Ablex Publishing Corporation. Note!! You can download this entire book for free by clicking on this link (19.34 MB PDF).